Posted on August 25, 2010 June 20, 2012 Categories Interesting, Memories5 Comments on Remember Sesame Place in Irving? Some of the more exotic stamps, such as postage due, official mail stamps, or just stuff that went beyond the local post office’s inventory, had to be ordered through the USPS‘s Philatelic Catalog. This catalog was neat: all stamps would be ordered at face value. The purchaser filled out a computer-read form. Shipping was reasonable. They would even cut you special portions of sheets, like plate blocks, if you ordered enough stamps. A rare treat was a philatelic window. These were special USPS stores in certain metro areas. Catering to collectors, their stamp offerings were much more comprehensive than found at standard counters. The only philatelic window I experienced was when my grandmother brought me to Dallas’s goofy Olla Podrida Mall. It had a large post office in the rear which had the Dallas-area’s philatelic stamp window. This post office stayed open for years after the mall closed; I recall the philatelic window being near the hallway leading to the main part of the mall. In the 1990s, the USPS began churning out stamps much more rapidly. Additionally, the USPS phased in self-adhesive stamps that could not be separated, necessitating purchases of an entire sheet at a time. The post office would not sell just one self-adhesive stamp as it would damage the adjacent stamps. Fortunately, these days, self-adhesive stamps are separable from adjacent stamps. All these factors combined forced me to stop collecting new stamps in the early 1990s. But I have a nice 3 cent stamp section. More on this later. Another turnoff was when I discovered my evil, arch-conservative leanings. Besides wanting to starve kids, tax the poor, subsidize millionaires, and deny health care to the working class, I became skeptical of the USPS. Purchasing stamps without intent of using them voices unbridled affection of an inefficient, union-controlled, money-losing, make-work bureaucracy whose stamp subjects are carefully chosen to maximize political correctness. Don’t believe me? Look at the qualifications of the members of the Citizens’ Stamp Advisory Committee; almost all are democrats, academics, or former bureaucrats. These days, if I buy a new stamp, it is because I like it, not because I am a pinhead mindlessly collecting all possible samples of this bureaucracy’s effluence. Back to my stamp collecting days: I had a Linn’s Stamp News subscription. A couple of times, I managed to get a letter to the editor published. Linn’s Stamp News was a fascinating cover-to-cover read the first year, but it felt progressively more silly the longer I was subscribed. I think I finally dropped my subscription in the early ’90s. I still have all my supplies: stamp tongs, watermarking solvent, hinges, Prinz stamp mounts, perforation gauge, etc. For a time, I could get supplies for cheap from Dwight March Enterprises. Dwight ran a stamp supply business alternately out of a small warehouse near Lombardy Ln. in Dallas or his north Dallas home. He got in trouble with manufacturers because he sold their stuff too cheaply. Apparently they forced vendors to sell at no less than a specific price. The manufacturers pressured Linn’s Stamp News and possibly other stamp publications to keep his ads out of their publication. The insides of our albums are pretty similar; mine is somewhat better filled out than his. It’s from 1853 and is probably worth a dollar, if I’m lucky. Yeah, that’s it! A measly dollar. I might get 10 cents for each of these unused 3 cent stamps on a good day. I have pages and pages of unused 3 cent stamps like this. Not long before he died, my grandfather gave me a nice quantity of unused plate blocks and plate strips, mostly from the 70s. They don’t seem to be worth much more than face value! Actually, face value may be lucky: eBay completed auctions consistently show large lots of unused plate blocks selling for below face value! My favorite stamps are the definitives. Brief tutor: definitives are the utilitarian stamps that provide all the goofy face values. They are typically printed for years straight. The other type, commemoratives, are the everyday stamps honoring people, events, or things that regularly rotate out. In assembling my collection, I got my father to bring me to stamp shows from time to time. They were often at hotels 5-10 miles from my house. One time my father brought us to an Adam’s Mark hotel in west Houston; that was a huge treat for my brothers and me. I usually purchased specific stamps or small lots of unused stamps at these shows. Over time, I assembled a lot of extras, which are now in a couple of stock books. I think some of these may have a little value, especially that 20 cent plate block in the foreground on the bottom. My grandfather was kind enough to give me a collection that probably came from his father. They are all used stamps, about half international, half domestic, and all virtually worthless. 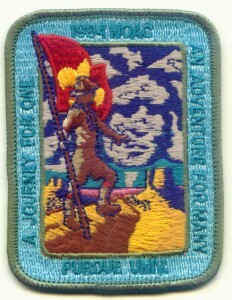 I’m trying to find a Scout or someone else who could use these stamps to earn a badge. To cut down on bulk, and to make sure I have a broad collection, I may sell off all my surplus stamps and plowing the money back into the core H. E. Harris album. What’s my biggest lesson learned? Stamps are a terrible investment. eBay completed auctions make it all too clear that everyday stamps hardly appreciate, and when they do, it’s almost always below even insanely safe investments such as 30 year federal bonds. When I attended Groves Middle School (PNGISD), I competed in mathematical tournaments sponsored by the Texas Math and Science Coaches Association and local schools. The pinnacle was Texas’s University Scholastic League‘s Elementary and Junior High Academics competition. My specialty was Calculator Applications. The test’s 80 questions’ difficulties progressed through high school-level problems. Most problems were complicated arithmetic, but 2 out of every 10 questions were word problems. My “secret” was I could rapidly translate the arithmetic into a series of keystrokes on my TI-60 calculator. I mastered the exact position of its buttons and its order of operations. I also has to use scientific notation as only three significant digits were usually allowed. Another secret is my TI-60’s slight warp, possibly because of pocket storage. It wobbled while I slammed keys, distracting other students with its rhythmic rapping on the table. Some of these students were already distracted just seeing me work in hyper-spaz mode. The last few word problems always gave me trouble. I could easily do arithmetic-style problems like finding the cosine of (34+41.6)/23. But if asked the local angle given the adjacent and hypotenuse of a right triangle, I could not figure it out. One time my father sat me down at our Groves, TX dining room table and tried to teach me these geometric concepts. My 6th grade mind neither “got” nor was interested in those high school concepts. Once I got all the way through the test, I would return to the beginning and rework problems. I always did well at the local practice and TMSCA events. In fact, I was first place in the entire state for TMSCA Calculator Applications in 6th grade in 1989. I spanked the competition at a local TMSCA tournament. All local tournament first place winners’ tests got mailed to the state office which then compared winners to determine state titles. I remember being shocked when the Groves Middle School science teacher (whose name I cannot remember–never took her class) broke the news. I never did as well at UIL events. At regional UIL tournaments in Dayton, sharp Asians from the Houston area edged me out. Why did I write this article? It’s time for the trophies to go. They are taking up valuable closet space and haven’t seen daylight in 8½ years. I took pictures of all trophies individually, pried off the plaques, and placed the plaques them on a sheet of paper for long-term keeping. (Yes, I remember that sweater.) 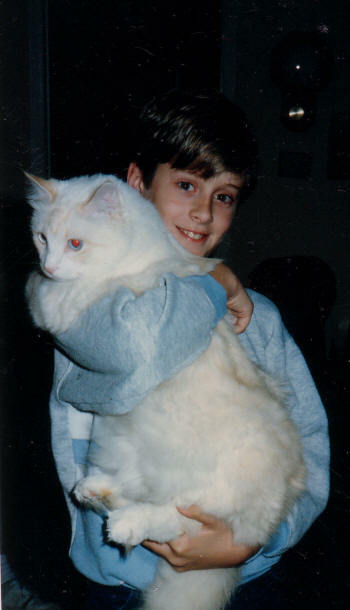 His name was Nicholas Pennington, but we called him “kitty.” My dad called him “Kitty Lickins’.” He was a huge, white, long-haired cat with coarse hair. You could see some very faint orangish tabby markings on his forehead. We got him in Van, TX in 1985 or 1986 when a church member called us about a white, friendly cat that took residence in his tree. We drove over in our ’77 Oldsmobile with some kind of food, and he came straight to us. That was a good sign, indicating a friendly, people-oriented cat. He may have wandered away from someone else’s house. We immediately took him to the Van Veterinary Clinic where the vet pronounced him healthy and about 6 months old. Did I say he was huge? If I remember correctly, he was around 15 lbs. He loved being held. When I used to type on the computer, he would jump on my lap and lay down, slowly cutting off circulation to my legs. When anyone would read a newspaper on the floor, he would lay down on the paper. He succumbed to some wasting disease in 1998, probably at 12 or 13 years old. Over the course of about 3 months, he wasted until he was too gaunt to get up. My father, the family Pet Executioner, had him put down that June. My mother got her in 1986 or 1987 from a litter of kittens at a house in Groves. This cat had a weird, schizoid personality in that she hid all day long and would only come out at night for certain people. In the above picture, she is spooked because someone is giving her attention during the daytime. I think part of her problem was that she was not well socialized as a kitten. Another problem is Micah and I weren’t particularly nice to her early on. I think we played football with her once in the Groves parsonage living room with her being the ball. Plus she didn’t take well to Skeeter, our sheltie bad dog, which we may have encouraged to “play” with the cat on occasion. When she voluntarily came out, she was extraordinarily affectionate. Female cats give the allusion of affection because of the “presentation” instinct when you rub just in front of their tail, but, I assure you, she was on a different level. She was so happy to get affection–on her terms–that she couldn’t stay still. She walked to and fro while you petted her, wrapped her body around your hand or torso, etc. There was one exception to her skittishness: she loved my grandfather. She would approach him at almost any time, day or night. All we could guess is he had some scent that pleased her? She died of the same wasting disease that the other cat got. 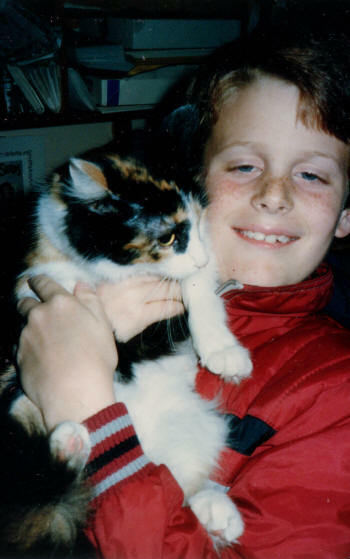 I think that the family Pet Executioner had her put down shortly after I left for my senior year in fall 1998.